This first phrase from today’s Epistle as the Church begins it’s celebration of the birth of our Lord really tells us what Christmas is all about. This is the announcement of the feast. The Word of God, appearing in our world, is the glory of the believer. He appears in humble surroundings, but invites all to the feast! 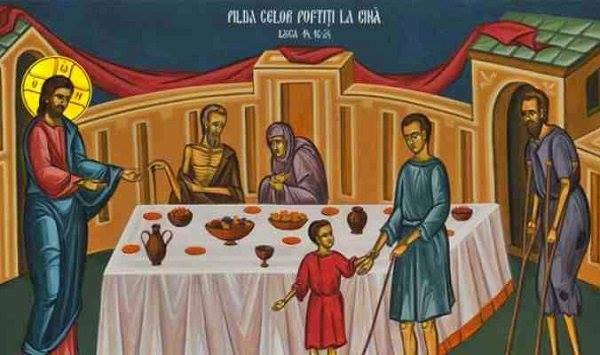 The gospel (Luke 14:16-24) tells us that those who are well off refuse the invitation, but it is “the poor and the maimed and the lame and the blind,” who come, it is those in “the highways and hedges” who are “compelled to come.” Mary probably realized this when she prophesied, “He has put down the mighty from their thrones, and exalted the lowly” (Luke 1:52). The angels appear to the shepherds in the fields, and they are invited to the house of the Lord. The glory of the Lord is his humility, and our glory is our humility. For all that, everyone is invited to the banquet, and the wise and the rich from Persia come with expensive gifts, though they too are outsiders, and the epistle tells us “there is neither Greek nor Jew, circumcised nor uncircumcised, barbarian, Scythian, slave nor free, but Christ is all and in all” (Colossians 3:11). Those who welcome Christ will put aside “anger, wrath, malice …” (Colossians 3:8). The first sticheron at Christmas chants, “let us proclaim the present mystery by which the partition has been broken and the flaming sword withheld. Now the Cherubim shall let us all come to the Tree of Life.” This is putting Christ back into Christmas!